Successfully Added MP3 Necklace - 1GB Blue Jewel Pendant to your Shopping Cart. 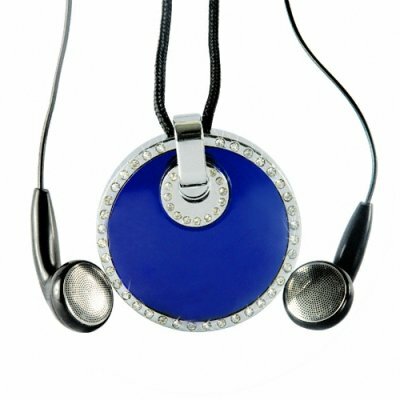 MP3 Necklace with designer blue jewel pendant. Beauty, style and sound from an MP3 player, what more can you ask for? Did we forget to mention that it is also water resistant? This MP3 Player has 1GB of memory (enough room for a thousand) and is updated like a regular USB drive, so it is quick and easy to update with either MP3 or WMA music files. If that is not compelling enough, this unit comes with powerful earphones for clear and crisp digital sound reproduction. This Stylish MP3 player necklace makes a great and unique gift for yourself or the one you love. This is a limited edition item, so get yours while supplies last!